Magento e-commerce lunch solution for Manger To Go. 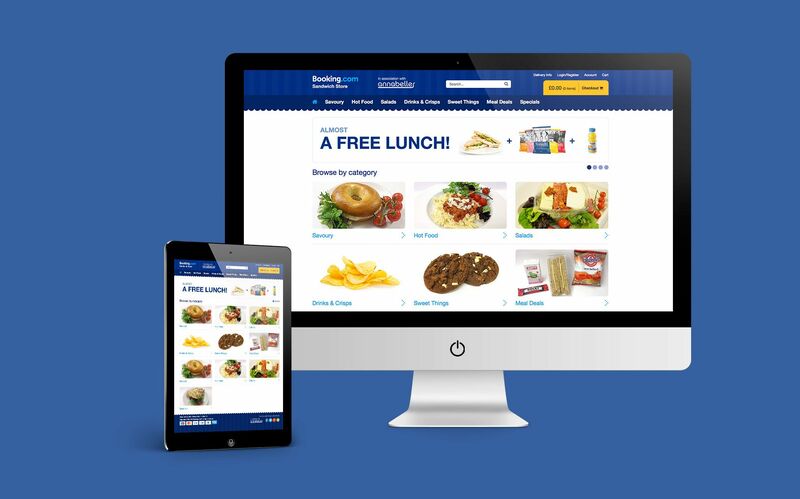 When we were asked to provide an e-commerce platform for 450 staff at Booking.com HQ in Cambridge, so that they could order their daily lunch online from their desks, we relished the challenge! Brave were approached by a local Cambridge store owner from Manger To Go. Knowing he could provide local freshly made lunches directly to their desk, he wanted to fulfil the orders, coming to us to build a streamlined digital order process. We couldn’t wait to get our teeth sunk into such an exciting opportunity to impress upon one of the largest online success stories on the planet. 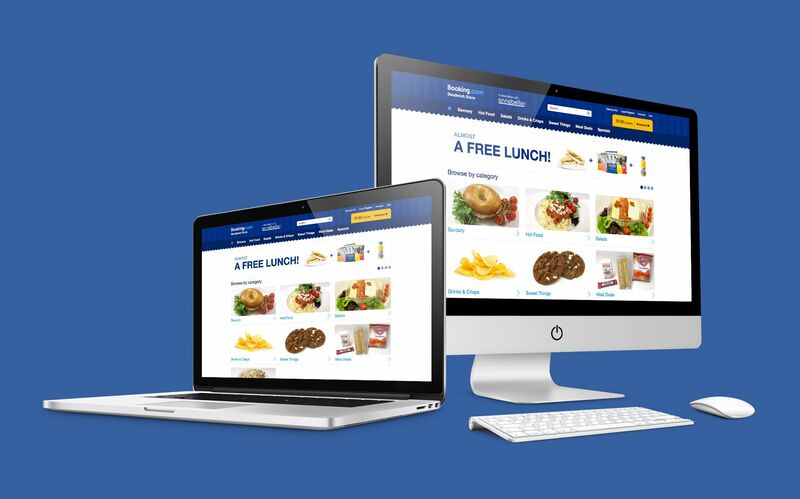 Since July 2013, our e-commerce solution has delivered a total of over 300,000 lunch orders, with around 450 newly released lunch choices. Manger To Go are a local café and luncheon provider based in Cambridge. One day, they walked in to Booking.com and offered to supply them with online ordering of lunches to the door for their 350 – 450 employees at their Cambridgeshire HQ. Booking.com loved the idea. However, Manger To Go didn’t quite know how they were going to do it until the deal was struck. Through close collaboration with Brave, we were able to make sure that a brilliant idea came to fruition and turned in to an overwhelming success for Manger To Go. After lots of dialogue with Manger To Go, we established that if the project took off and was as much a success as we all hoped, it would require a robust strategy. Although the project was for local food retailer Manger To Go, it was Brave that recommended the idea of using the Booking.com branding (with permission of course). It’s because of this that employees felt that the lunch delivery service belonged to them and was a service provided by the company. Booking.com were keen to make sure that the service was actually perceived as valuable by their employees – they wanted to make sure it was used. Being a call centre, they were keen to encourage more employee interaction at lunch times and so offering subsidised lunch at employees desks seemed like a no brainer. We set out to create a co-branded Magento e-commerce store which offered all of the available food options from Manger To Go. We also decided to keep costs to a minimum by assuming that the user would come into work and order their lunch once at their desk. Our estimate was that 99% of people would use the private website from a desktop PC and so a mobile website was deemed unnecessary at that point. As Magento experts, we were presented with a few technical challenges in the form of bespoke requirements, which we overcame with resounding success. Being subsidised, we needed to make sure that employees were able to add their discounted lunch each day. This was achieved by providing automated, once per day, discounts at the checkout. As a call centre, there are obviously shift patterns to take into consideration. We needed to be able to offer delivery slots to those employees working on weekdays and those working weekends. Albeit quite a challenge, we managed to provide a streamlined user interface and clear reporting to the administrators processing orders back at Manger To Go. This meant that delivery slots were clear and orders were correctly processed. In summary, we turned this project around very, very quickly. Within the first few days and due to incredible demand and take up by the staff of Booking.com, we were forced to upgrade the hosting to a more powerful server. Since then, the website has remained solid and stable – not a day has gone by in 3 years where staff at Booking.com have gone without their free lunch. This is one of the showcase Magento case studies which we are probably most proud of because it demonstrates clear thinking creatively, brilliant execution, and technical robustness. The results are overwhelming, both in terms of what we all set out to achieve, but also financially for our client.